Teamwork is almost always challenging, whether on the playing field, on the factory floor or in the C-suite. It’s even more challenging for virtual team members. Based on in-depth research and extensive hands-on virtual team management, this article will examine why virtual teamwork is challenging, discuss solutions and conclude by sharing emerging best practices. These tips will help novice and expert virtual teams alike to elevate their performance and well-being. There’s a serious gap between managers’ belief in the potential of virtual team performance and actual results. Research shows that more than 80 percent of virtual project teams perform poorly and 75 percent of cross-functional teams are seen as dysfunctional. This poor performance is because different fields and disciplines tend to become closed professional silos; for example, engineers and designers often don’t work well together on project teams. It’s a problem when the team members are in the same physical location; it’s an even greater problem when they work several thousand miles apart, belong to different cultures, speak different languages outside of workplace English and will never meet physically. Unlike their co-located peers, virtual team members have no “water cooler moments.” This type of informal exchange involves the practice of soft skills, which naturally generates rapport and trust. Without such trust, miscommunications, misunderstandings and interpersonal conflicts tend to grow and fester. Workplace conflict costs $359 billion annually in the U.S. alone. While there’s little research about interpersonal conflict on distributed teams, it’s safe to assume the costs are proportional. Research does reveal a consistently low success rate for software development projects. On average, only 39 percent of projects are ever completed successfully on time and budget, and 18 percent are cancelled or delivered but never used. Forty-three percent are late, over budget, or completed without all of the required features and functions. In one survey, 75 percent of respondents said they believe “from the start” that their projects will fail. Professional sports teams and orchestras practice prior to public events. However, virtual project teams, even with large operating budgets, are rarely afforded this opportunity to prepare by getting to know one another. Virtual strangers are simply expected to become high-performing teams without practice. 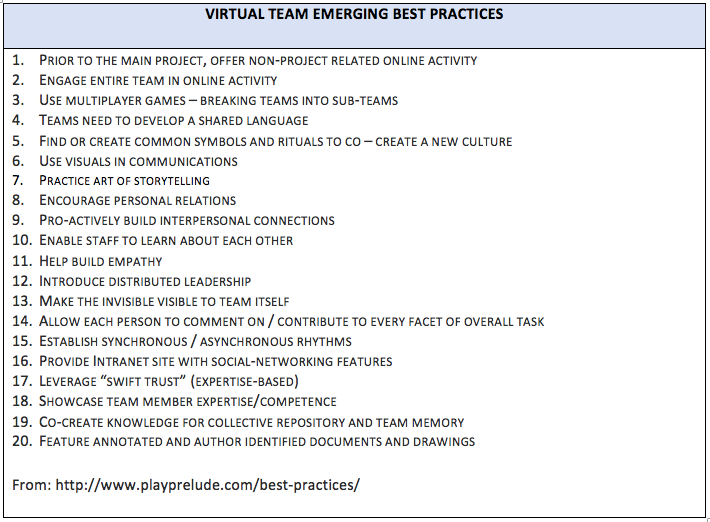 Many sectors, in siloed isolation, have been developing their own best practices for virtual teaming and leadership. Prelude research has identified 20 emerging best practices, drawn from several fields and academic studies. These practices share common themes and approaches about engaging and emotionally connecting the whole team online at the start of a project. The goal is to break the ice by providing the virtual equivalent of water cooler moments. In his book “Strategic Management and Leadership for Systems Development in Virtual Spaces,” Christian Graham writes, “Research has found that virtual teams whose members spend time at the onset of their work getting to know each other, experience greater trust among members down the road, which facilitates the overall effectiveness of their working together.“ This process largely involves soft skills practice to develop self-awareness, creative thinking, empathy, communication, collaboration and appreciation for diversity. It is still early days as we pioneer new ways of learning how to work well with “virtual strangers” who live on the other side of the world. In January 2016, the Yale School of Management introduced a new virtual team management course that is now mandatory for all MBA students. This requirement is a harbinger of things to come. Ultimately, virtual team management and its associated competencies will become rationalized in the same way the practice of project management once was. Virtual team management and its associated competencies will become rationalized in the same way project management was. Dr. Howard B. Esbin is the creator of the Prelude Suite™, an experiential learning resource that empowers virtual team performance by strengthening trust. His writing has been published by Education Canada, the International Labour Organization, UNESCO and IGI Global.